Local commercial fisherman Fitzroy Mitchell and local sport fisherman Gary Clifford were both recognised for their participation in Billfish tagging, at a brief presentation on Wednesday at the Fish Market Complex on Melville Street, St George’s. On 27 January 2013, about 10 miles west of Grenada, SGU student Joshua Nadolny fishing on board Gary Clifford’s charter sport fishing boat “Yes Aye” caught a 50 lb. Sailfish (Ocean Gar) which they then tagged & released alive — tag number BF529340. On 20 May 2014, Fitzroy Mitchell’s commercial fishing boat “Brilliant Girl” harvested a sailfish on their long line gear about 20 miles north-west of Grenada and noticed that it had a tag in it — number BF529340. The sailfish had survived almost 17 months and may well have travelled away from Grenada before returning and being recaptured. 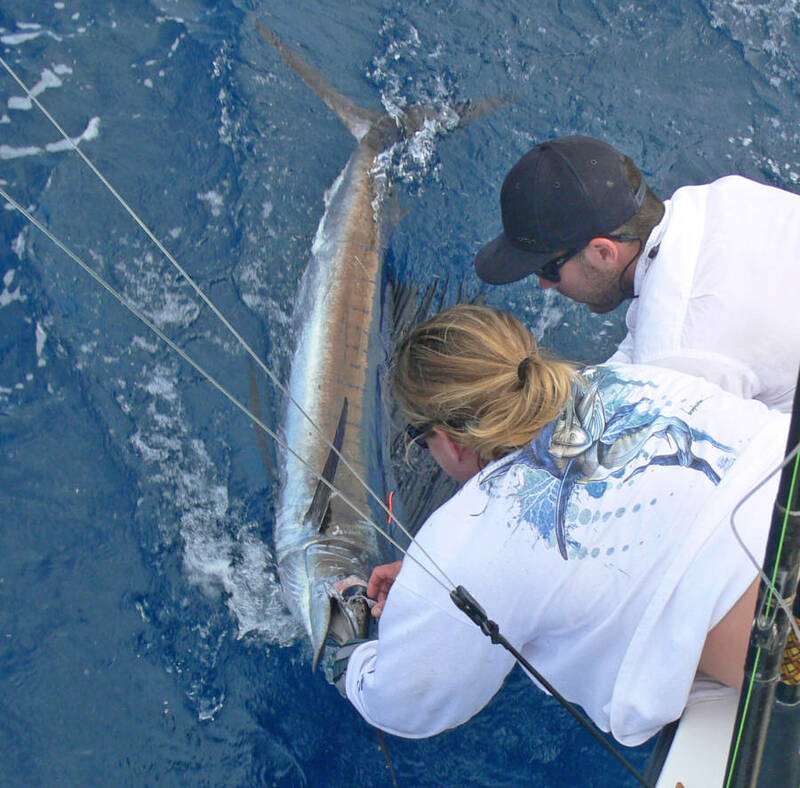 In January 2007 another sailfish tagged & released on “Yes Aye” in Grenada was caught & released again on 30 May 2007 in Key West, Florida, having travelled 1600 miles in 5 months. Recaptures of tagged fish are rare (less than 2% on average) but when they are the data returned regarding their movements and growth rates can be very useful to fisheries scientists. The Billfish Foundation based in Florida USA, which issues the tags and maintains the database, is the only non-profit organisation dedicated solely to conserving and enhancing billfish populations around the world. 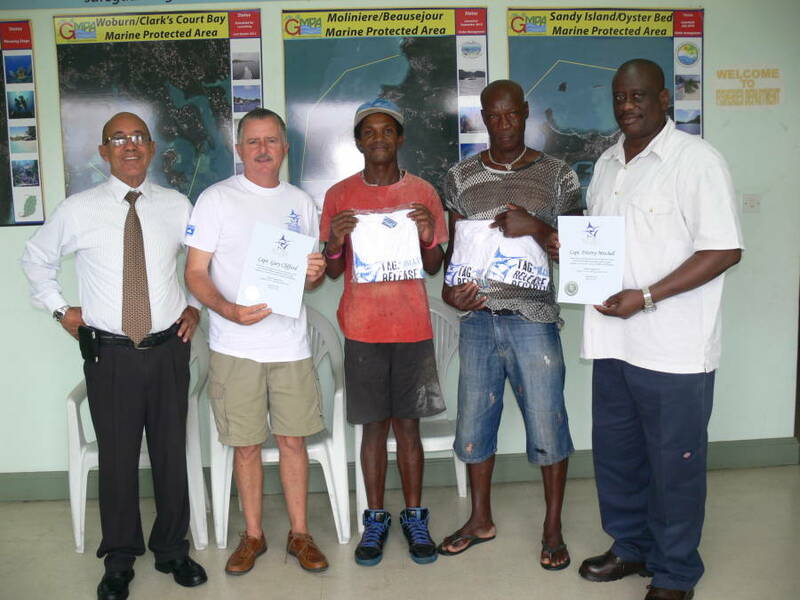 Chief fisheries office Mr Justin Rennie, assisted by Mr Richard McIntyre chairman of the Budget Marine Spice Island Billfish Tournament, presented both fishermen with Certificates and T shirts issued by The Billfish Foundation. All fishermen are encouraged to report any tagged fish they may catch as each instance may yield useful information for the future. A three tiered strategy of research, education and advocacy is employed by TBF in order to create marine conservation strategies that benefit oceanic resources while also empowering the recreational fishing community.